You may have noticed but your wallet is feeling a little more full when you visit the pump these days. Prices of gas have dropped near this year’s low and on their way even lower. Across the U.S.A regular unleaded averages $3.28 per gallon. However certain places are paying just $2.75 because of less demand after the summer months when people hit the road more often. Other contributors to lower gas prices are large global crude oil inventories and vast supplies. Two key factors will keep gas prices on this downward trend throughout the winter months. Winter-blend fuel is cheaper to make as most oil companies have made the switch. 10% of gas stations in the U.S.A have gas prices at less than $3. Last year only 3% were. There was a steep drop in average gas prices on Monday with a decrease of more than 2 cents. This was the steepest drop in almost a year. There is not only good news for everyday motorists but there has also been a decline in diesel gas prices for truckers. This week prices were down to $3.71 per gallon which is down from $3.89 a year ago. Another benefit is that nobody is trying to stop the slide in oil prices because that is OPEC’s responsibility. OPEC could try to push prices back up by limiting production. This past October, OPEC made the decision to maintain production at normal levels, which resulted in lowering prices for oil even more. 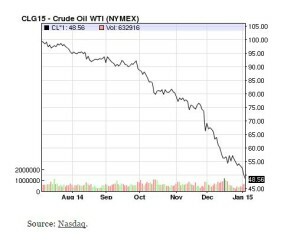 Since the Summer of 2014 crude oil prices have dropped more than 50 percent. Ranging from over $100 a barrel to under $50, which is a massive decline. From the mid-1980’s to the mid-2000’s, prices were never above $60. Save even more on gas prices when you use an engine treatment that works even better with winter-blend fuel grade. GO15 is an engine treatment that increases your vehicles miles per gallon and lowers your emissions. It works by smoothing the metal surface in your engine, reducing friction giving you more miles per gallon.